As you undertake the journey towards digital transformation, you need to count on someone you can trust to guide your business. 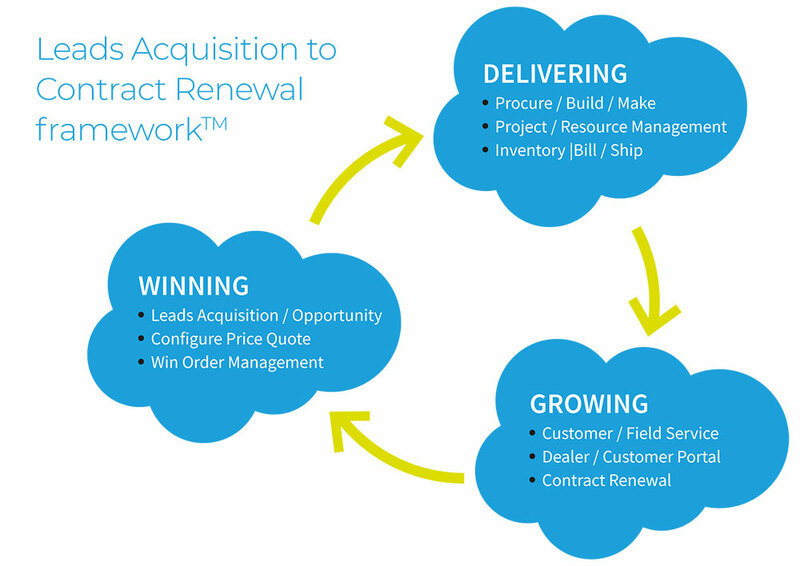 With its Leads Acquisition to Contract Renewal frameworkTM, Nubik has this sought capacity to take your business to where it should be. Our solutions offering covers the entire spectrum of a company’s key operations, from the acquisition of sales leads to the renewal of contracts, in order to offer an individualized “digital” solution that is perfectly adapted to your business model. Furthermore, our strong skills in understanding your business case, coupled with deep technical knowledge of CRM / ERP technologies provided in our framework, allow us to excel in the implementation of your digital transformation project. It’s no coincidence that we helped some of the fastest growing companies throughout Canada and US streamline their business operations for profitability and growth for over 16 years. Want to see ‘how’ our Solutions framework applies to your business reality? ORDER YOUR TAILORED DEMO WITH ONE OF OUR DIGITAL EXPERTS. If you prefer to explore parts of our end-to-end solutions framework, you can browse through our solutions offering by industry and by business functions. You will find a complete selection of hand-picked CRM & ERP cloud solutions – all powered by Salesforce + Financialforce – to deliver maximum business value and sustainable market advantage. Nubik offers cloud-based business solutions that address the strategic and tactical needs of a variety of different industry verticals. Nubik offers cloud-based business solutions that address the different business functions found in each organisation. Automate and enhance the entire sales effort, from lead management to accurate customer quotes to contracts with customised documentation; leverage dynamic reporting to focus sales efforts and artificial intelligence to identify new opportunities. Target, attract, and nurture quality leads from initial awareness through to purchase intent and beyond; deliver targeted info and calls to action at each phase of the customer journey; rapidly identify and allocate the most effective marketing expenditures. Achieve complete and real-time visibility on revenues, spending, and capital commitments across the organisation, its divisions, and projects with automated and custom reports; automate complex revenue recognition, including support for recurring revenue models (e.g., subscriptions), while meeting relevant standards. LEARN MORE. Take control of the order-to-cash cycle with accurate configuration, pricing, and quoting of customer orders and timely fulfilment; manage production more effectively with real-time visibility on resource planning, procurement, manufacturing, inventory, warehousing, and logistics. Ensure consistent customer experiences across channels and touchpoints, including mobile; leverage artificial intelligence to identify opportunities to enhance customer engagement and deliver delightful experiences; empower field service workers with the data they need to be effective. Build with modern development frameworks and services to create new cloud-based applications or migrate existing functionality, while reducing complexity and eliminating software maintenance; augment field service efforts with full remote access to user data, current documentation, and other relevant info.